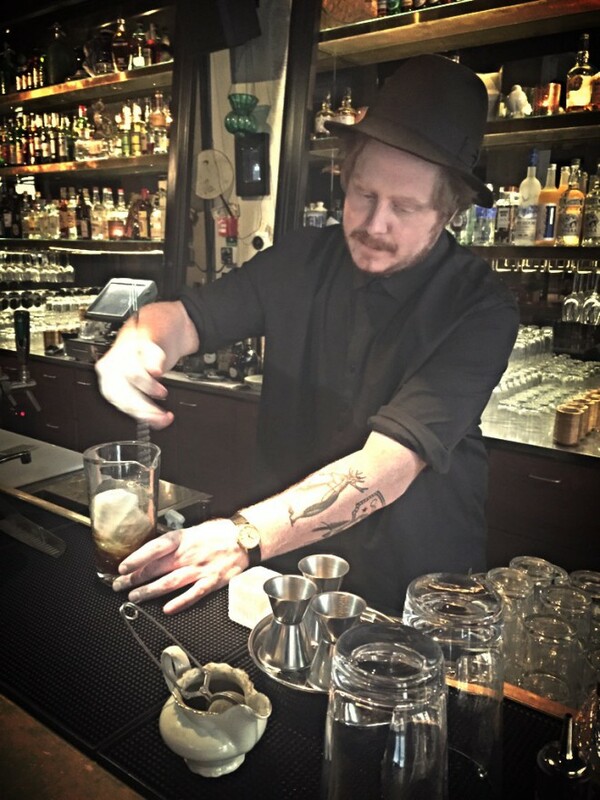 Hampus Thunholm, is head bartender at Ling Long in the Story Hotel in Stockholm. He makes two cocktails for us, one is with whisky and Carpano, and the second is with Vodka and duck fat. I’m Hampus Thunholm, head bartender at Ling Long in the Story Hotel, Stockholm. I am 27 years old and come from the northern part of Sweden. I love spirits, and everything related to alcohol, that’s why I wanted to become a bartender. You work with great people all the time and you can see instantly the reaction of the audience regarding your cocktail. You can see from their very first sip, if they like what you have done. Before concentrating on cocktails I worked with wine for 4 years, but even if you are super creative, you don’t really get to put your signature on it like you do with a cocktail you’ve created. I like to have more control with what I do and if I am happy with what I’ve done, I want people to try it. The cocktail world is so big and yet so small at the same time. Everyone knows everyone around the world, that’s why I like it too, it’s so inspirational. One year ago I started a company called Bottles with my friends, it’s a bartending co-operative company with 3 bartenders right now. We started pop up bars in the old town with 25 seats, and we would change the location every five weeks… but not only the location, we’d change the cocktails list, the playlist, the ambiance, everything. It was super fun, and one day Ling Long contacted us, explaining that we can keep the same spirit of our concept, but keep it in one bigger place. It was a real opportunity to show more people what we are able to do, so we said yes and here we are. Exactly the same as where we are. It’s an old garage, really rough, industrial and that’s my style. I would add some pieces of art because I love art and maybe have a dim sum menu for food. Because we are rushing all the time, a fourth bartender would be nice too. I’d also like there to be live music in one corner. The menu would be a smaller list of about ten cocktails so it’s easy to choose for the client, then have a separate list with 40 classics, because I love to work with a huge cocktail list. I would cut the number of spirits, so we had to work to be more creative and inventive. In Stockholm, my favorite bar is Little Quarter or the Rock bar, a dive bar in a fancy night club where you only hear classic rock music. For cocktails, right now I prefer to work with tequila, it’s a huge thing at this moment in Stockholm. Tequila is a super clean spirit, the blanco tequila is perfect. It’s very honest, it tastes how it should taste. You don’t need to add sugar or put it in a barrel. At this moment I use a lot the tequila Cabrera. A good cocktail for me is about balance, balance, balance. I prefer to drink a cocktail that I don’t like with the right balance, than one I like that is unbalanced. The other product I want to highlight is duck fat. I like the flavour profile and what we do with it. We use a traditional Chinese method to smoke the duck fat with flowers and sugar. You should go to meet Natacha Davis at Nitecap in New york City. To all our readers, this is our last post for 2015. Our first interview for next year will be on the 4th January and it features someone from one of the world’s 50 best bars, based in London. Wishing you all a fab holiday and a Happy New Year. Thank you for all your support and we look forward to next year, meeting more incredible bartenders and sharing their creations with you. We are off to New York in January, so please recommend people we should meet or contact us if you would like us to interview you. Cheers/Santé.